We decided to camp near Camp Reinga for the night, only to find it raining and foggy the next morning. It's disappointing. This place is amazing and shooting with sunrise as backdrop would be amazing. 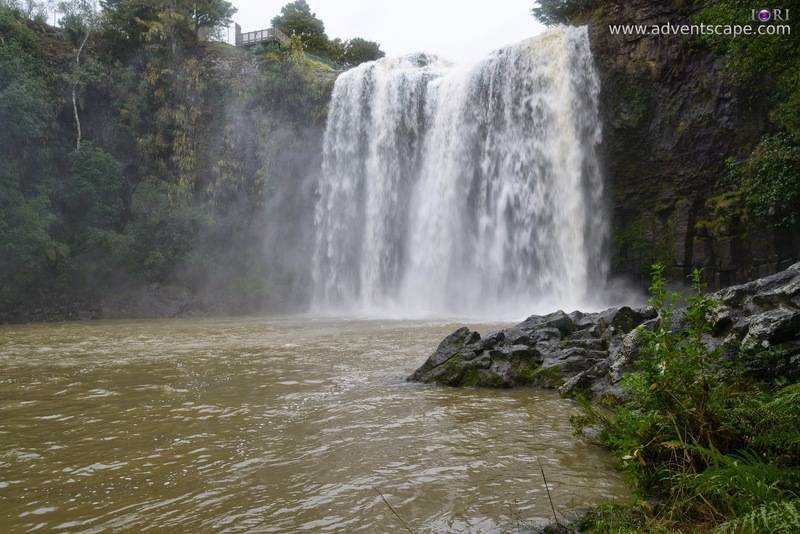 So at 9am, we decided to head back to Auckland and drive all the way to Matamata. This a long and tedious drive. It's an estimated 7.5 hours straight from Cape Reinga to Matamata (excluding rest / breaks). 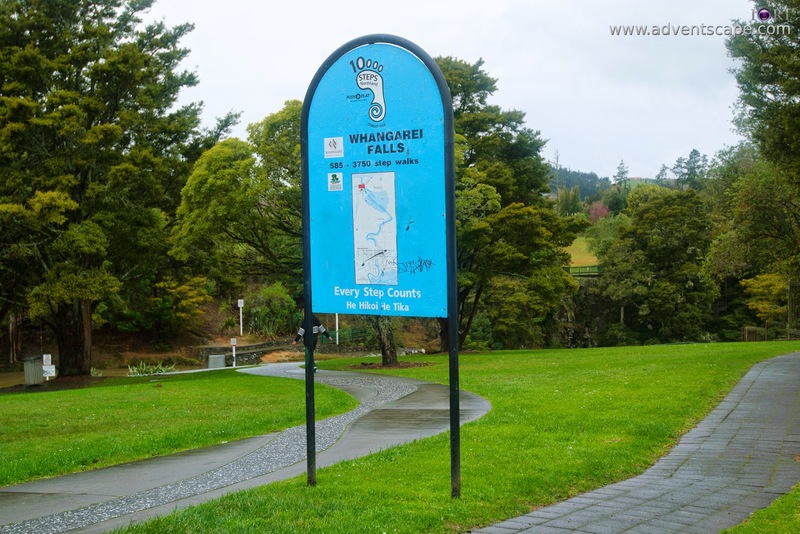 As we drove to Whangarei, we saw a 'Whangarei Falls' signage. We're already hungry at that time so we first ate before deciding if we're going to visit this waterfalls or not. 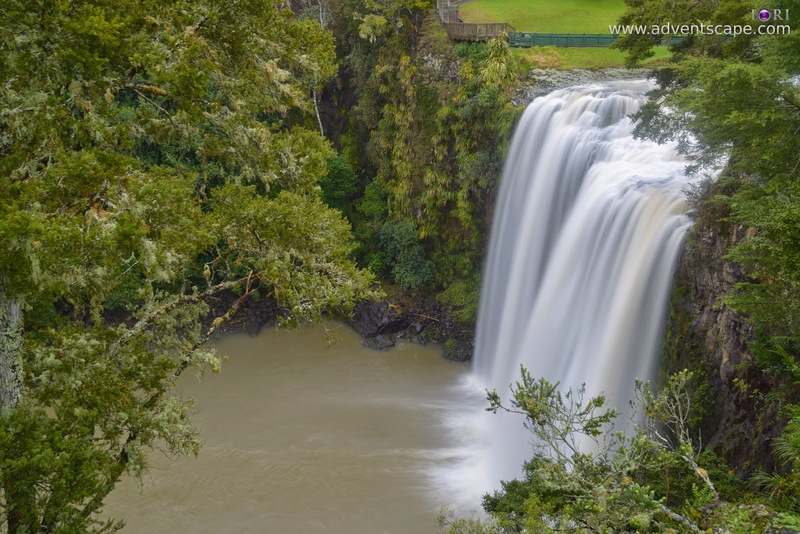 Its seemed like we won't be doing anything for the day (7.5 hours drive during winter takes too much time), so we decided to visit Whangarei Falls. In the main Whangarei central, this might just be 10 minutes drive. It's so close. You won't miss this even if you don't have a GPS as the direction is well defined by signage. The track to the waterfalls is a loop. It will only take you 30 minutes to complete the track. But if you're a photographer, chances are you're going to stay here longer. There will be signages when you enter the parking lot. Immidiately, there is a clean toilet. Take advantages of this as there will be no toilets available when you start walking. This area is cool, particularly at the Falls Pool, so it's best use the toilet. 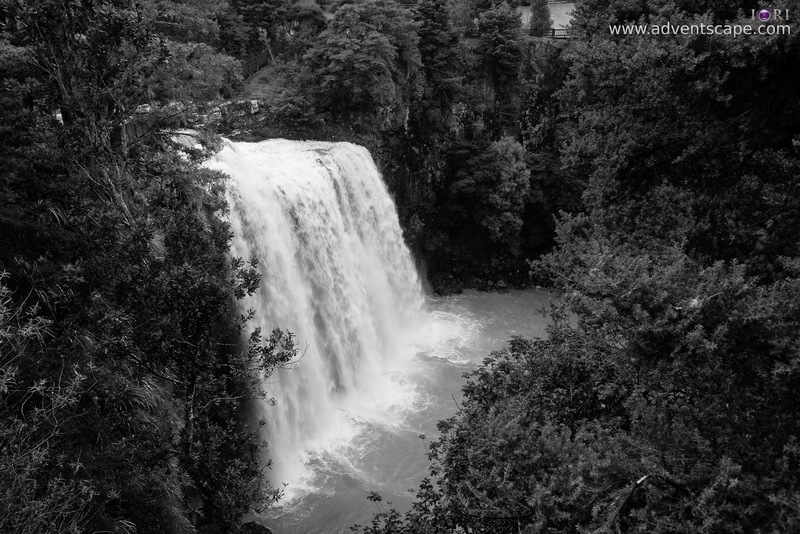 The first viewing location gives you a birds eye view on the left side of the falls (left side if you're looking straight at the waterfalls). It's an interesting view, but I moved on after taking some shots. From here you'll see that there is a bench beside the fall's pool. 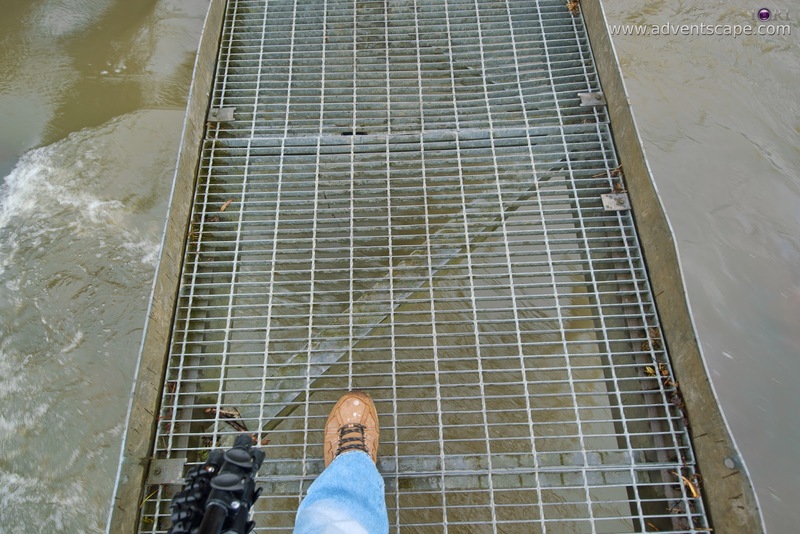 Before going to the next vantage point, you'll come across a bridge with no safety handles. If you're not feeling safe, you can walk the other way. You don't want to be forcing yourself crossing the bridge and tipping over. It's a long way down the waterfalls. I completed this track 'clockwise' walking across this bridge. You can walk counter-clockwise, avoiding this immediate bridge. When coming to the bridge without handles, just turn back and go back the same route you've taken. How Wide is the Metal Bridge? The next vantage point is like the first one, but you'll be positioned at the right side of the falls (with reference if you're looking straight at the waterfalls). It's also a bird's eye view. I think it's the same view as above but you're looking at the right side with more foliage framing your view. 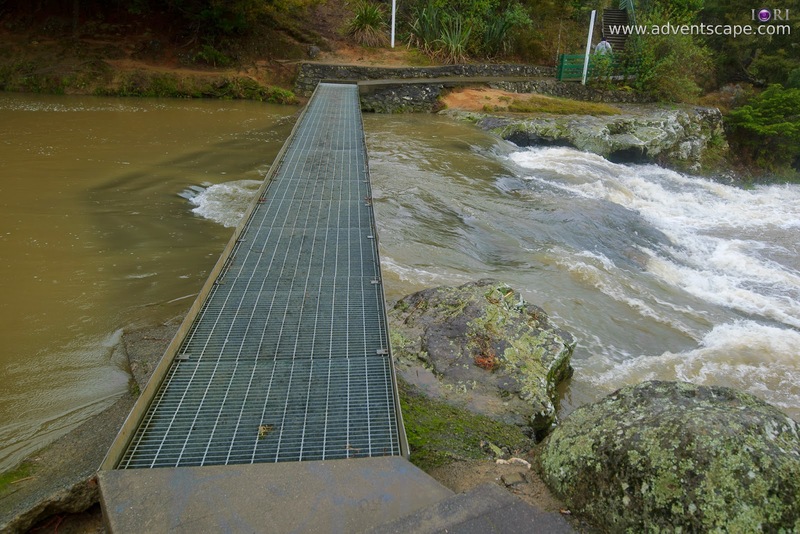 The path and the flight of stairs at Whangarei Falls is good. I don't see any issues with these as long as you take care walking. The next vantage point is the Fall's Pool. This is where all the water is collected before going to a stream. This is magnificent and majestic! I love this area (as well as other Fall's Pool I've seen on other like Rainbow Falls) When we came here, it was drizzling. It's good since there are more water falling. It's bad because there are more water spray. 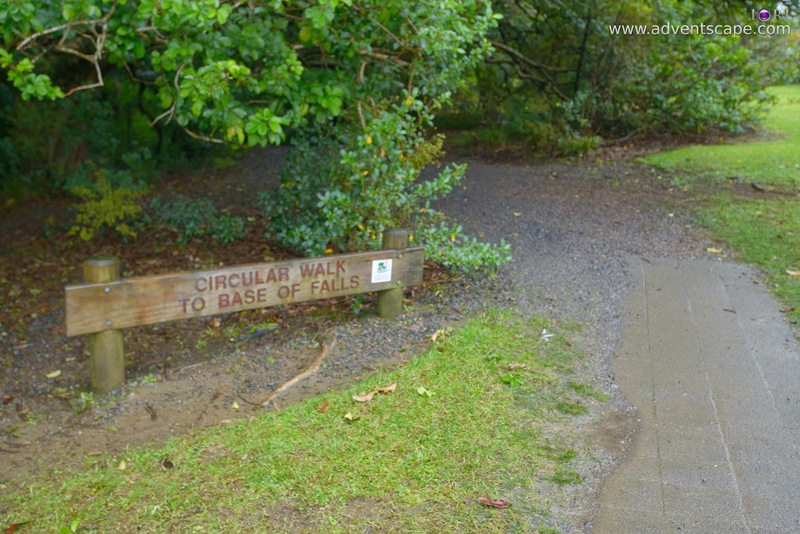 You can approach the Whangarei waterfalls in either the left or the right hand side. As a photographer, I prefer to approach both as both have different perspectives. At the right hand side (if you're facing the waterfalls), is a rocky area. You can photograph rock textures with water. The right hand side has the rocks touching the water. On the left hand side, there is a bench to add to your composition. This is also where the grassy soil meets the water (unlike the right side of the falls where rocks meet the water). You may choose a side, but I love both sides. 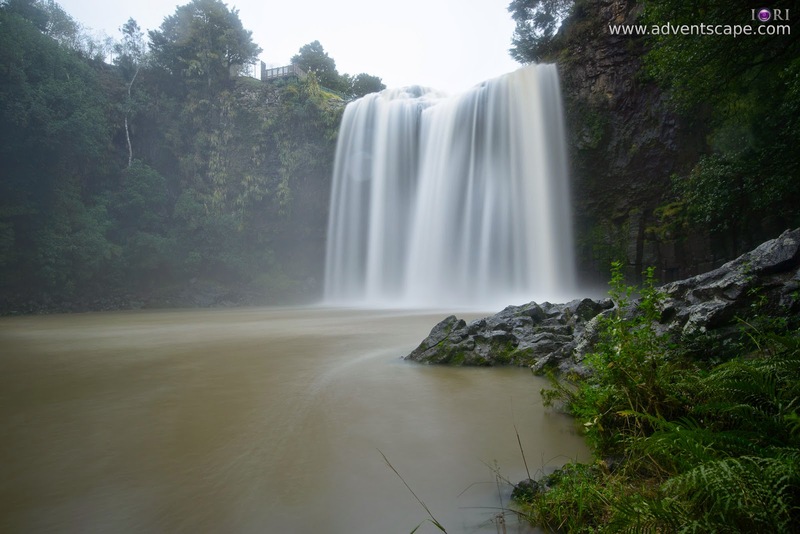 Unfortunately, I don't have a photo of the left hand side of the Whangarei waterfalls. The water spray is too intense (add to that it's also drizzling). It creates water spots on my photos. I can't get a clear shot! The Fall's pool is probably the highlight of this place. I love it and would like to take more shots but since I'm just travelling, time is very limited. We're still halfway going to Matamata when we arrived here past at 2pm. 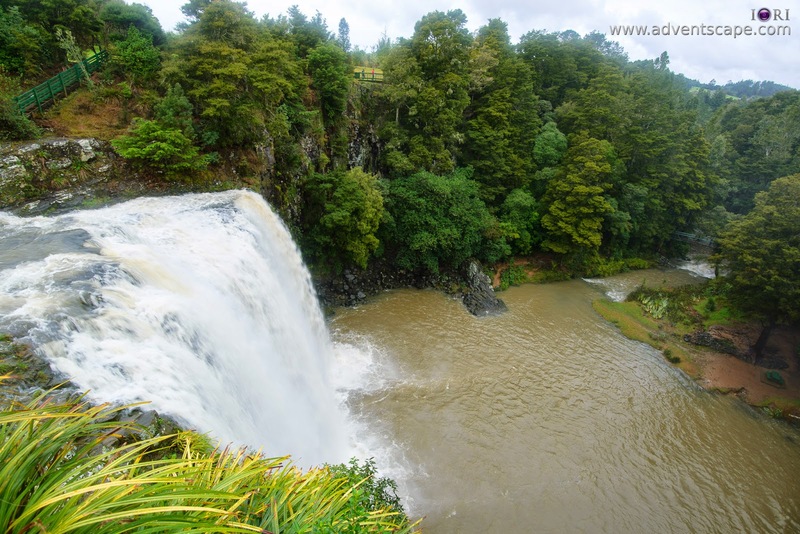 Before completing the Whangarei falls track, there is another vantage point. It's almost the same viewpoint as the first vantage point I mentioned above. This vantage point is a bit lower. I took a photo nonetheless. Above is a comparison between a normal shutterspeed and a slow shutterspeed. The water flow is different as the slow shutter brings silky like feel with water, while the normal shutter gives texture. 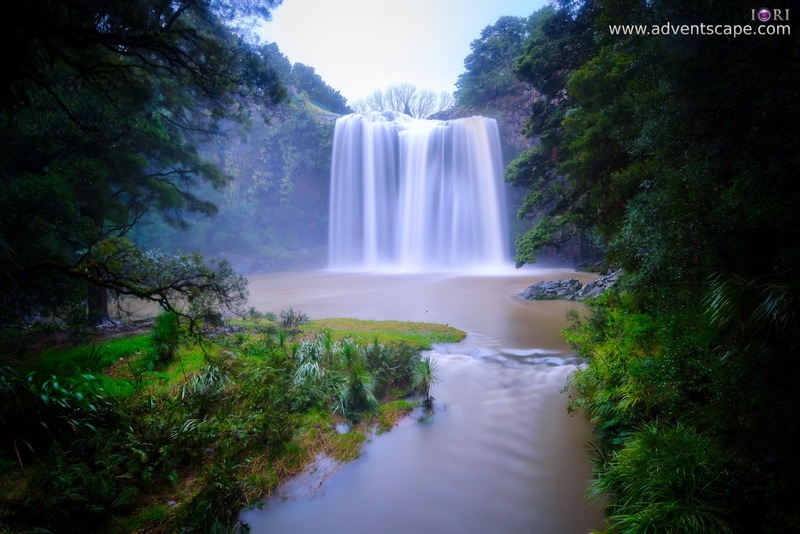 I personally love slow shutter on bodies of water (seascape, waterfalls, lakes etc). Every time I shoot these subjects, I shoot 2 pictures: one is normal shutter, the other a slow shutter. If I only have to shoot one, I'll choose, slow shutter. 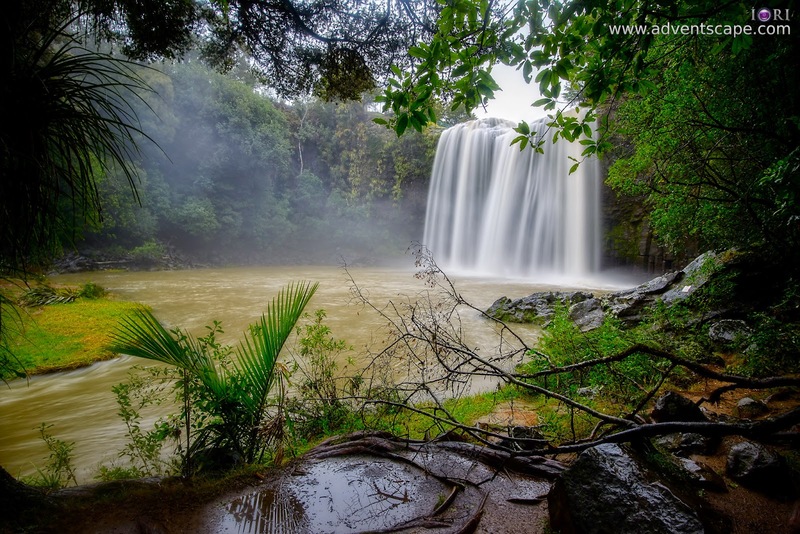 Whangarei waterfalls is an amazing and magnificent place. 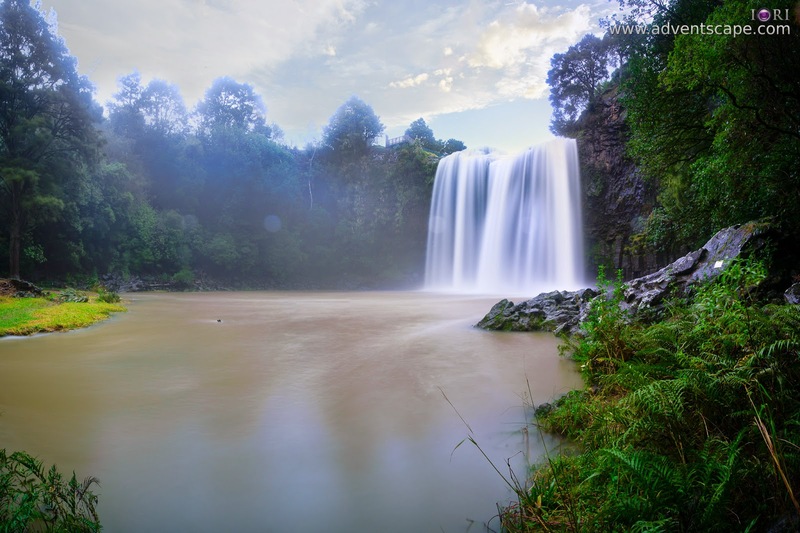 Like Rainbow Falls, you can do many different compositions in this area. You can choose from different vantage points - although you'll spend most of your time in the fall's pool (like I did). If, by any chance I come across this area again, I'll gladly visit this place.